Do you subscribe to a video streaming service? If so, you’re in good company. Netflix boasts 55 million subscribers in the US alone. Hulu, 20 million. HBO Go, 5 million. Turns out, that we quite like having all those movies and TV shows on demand. The breadth of content on these services is about to change severely, though. These services, which so violently disrupted good old cable TV, are about to be disrupted themselves, with a slew of new platforms entering the market in 2019, and Disney leading the charge. Can the average household tolerate this level of fragmentation? We take a look at how the changes could affect the big streaming players, and your bank balance, too. A few years ago, the rise of the streaming service changed everything for home entertainment. Suddenly, with the option to get your media from outside the traditional cable model, viewers realized that they were overpaying for traditional cable TV packages, and started to leave in their droves. It’s an exodus that continues still, and as of 2018, 33 million Americans have ditched traditional TV services entirely, and replaced them with online streaming instead. On paper, it’s not a hard decision to make. With the average monthly cable bill purportedly costing around $100, buying an aerial for free to air TV and chucking 10 bucks a month at Netflix makes for a substantial saving. At least, it did at first, when there were only a handful of streaming services to choose from, and they each had a decent library. That’s now all due to change. When Disney announced it was to launch its own streaming service in 2019, it signified something of a watershed moment. The Mouse is hungry, and it has more than cheese in its sights, gobbling up IPs and studios like there’s no tomorrow. For current streaming services, this is problematic. Go to the Wikipedia page for ‘List of assets owned by Disney’ and your finger will fall asleep before you’ve scrolled to the bottom. When the Disney service launches next year, it will take back all of this programming from the other services to populate its own. No more Marvel. No more Star Wars. No more Pixar. No more Disney, full stop. Unless, that is, you also sign up to the new Disney streaming service. The Mouse House will also be making new shows, exclusive to the service, including a return of Star Wars: The Clone Wars. I know, I know, you’re already reaching for your wallet. New TV: A concept developed by DreamWorks co-founder Jeffrey Katzenberg, aiming to provide original 10 minute shows designed specifically for mobile users. It will launch in late 2019 and has already received $1 billion in funding. DC Universe: Delivering classic DC Universe shows and movies, as well as new original live action and animated programs. Apple TV: A lot of rumour and conjecture around this one, but we do know that Apple has pinched a couple of former Sony execs and given them a healthy $1 billion budget to produce and acquire TV content. Add these to the existing platforms – Netflix, Amazon, YouTube, Hulu, HBO and so on, and that already busy streaming space is about to get a lot more crowded. All of them want the money in your pocket, and think they’ve got the content to win you over. So how will streaming services tackle the ongoing removal of content from their services, as studios take back their films and shows to populate their own platforms? Original content is key, and there’s no denying that providers like Netflix are pumping it out. In August alone, Netflix premiered six original movies, made on its own dime. The company has recently stated that 85% of its profits will go into making original content. While some of these shows and movies are clearly made on a shoestring budget, it also spends big on Hollywood names. Recent Will Smith vehicle Bright had a production budget of $90 million. And was universally derided by critics. 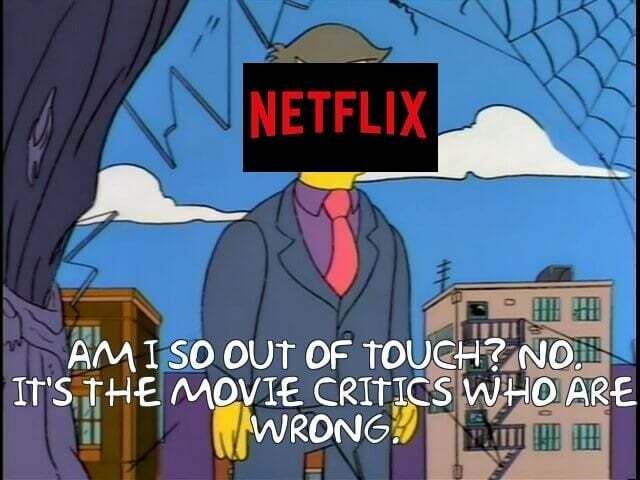 Of course, Netflix wasn’t too bothered, stating that the critics were “disconnected” and that the film had done well with its viewers. Bright 2 & 3 have since been commissioned, because naturally, everything is a trilogy these days. Netflix is also seemingly keeping Adam Sandler’s career afloat, with the movie star initially signing on for a four-movie deal in 2014, and then extending this by another four. As with Bright, the critics aren’t convinced, and all his Netflix movies have dire ratings on Rotten Tomatoes. Yet, still they keep coming, and if you’re a Netflix subscriber, you’re complicit in keeping them funded. We know that it’s difficult to please audiences with original content, but Netflix clearly hopes that if it flings enough new stuff at the wall, something will stick. For every new movie or TV show that would have been rejected by the Blockbuster bargain bin a decade ago, they might hit on another Orange is the New Black, Arrested Development or Better Call Saul. Amazon, too, is trying its hardest to bring people in with its shows The Grand Tour, Transparent and The Man in High Castle, all of which sit atop a pile of “not quite” and “almost-ran’s” that you’ve never heard of, but that all cost big money to make. As the future of streaming continues to become fragmented, we’ll be left with two choices. You can subscribe to one service and make do with its original shows and not much else, or subscribe to multiple services to get the best range of choice, paying a premium for a more diverse catalog. If that sounds familiar, it’s because this is pretty much how cable TV offers its packages, and the reason so many viewers were keen to get away from it in the first place. If you’re having trouble deciding between Netflix, Amazon, YouTube et al now, just wait until next year for that choice to become even harder. Do you plump for the Sandler sausage-making machine of Netflix, and forego Star Wars and Marvel, or do you get both? And what if you’re a car nut who wants to catch up on The Grand Tour, too? Will you pay out for a third video service? Sadly, these are the choices that the modern TV viewer will be left with. More choice is ultimately a great thing, but having to choose between increasingly diluted and fragmented entertainment services benefits no-one. It seems that in 2019, home streaming is going either to become much more limiting, or much more expensive.